We bring you round three of our consensus rookie rankings. 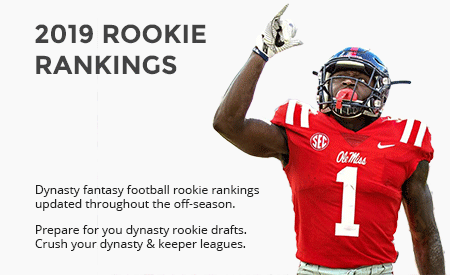 Editor’s Note: Make sure you’re ready for your dynasty league rookie draft by checking out our rookie draft guide, rookie rankings, and rookie draft cheat sheet. There are simply no better resources out there for dynasty fantasy football enthusiasts. We covered the consensus first round on Monday and the consensus second round yesterday. The first round has what looks to be elite-level talent with the likes of Leonard Fournette, Corey Davis and Christian McCaffrey, along with some other very exciting prospects. The second round features a lot of solid players who each have a legitimate chance to be contributors as well. This third round is certainly where the fun begins. Let’s face it – it’s not hard to take Davis or Fournette at the top of the draft. However, strong dynasty owners understand third round picks and even those beyond have real value and doing your homework on these players to make educated guesses on who may develop into contributors separates champions from contenders. You never know when you’re going to unearth the next Arian Foster or Tyreek Hill. 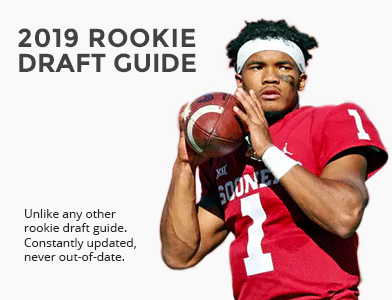 Learn more about each of these players by clicking on their name and going to our exclusive Rookie Draft Guide Player Profile page where available for an in-depth look at each of them you’ll simply find nowhere else. All of this should help you decide who to be interested in and hopefully dominate your upcoming rookie drafts. Consider Mahomes the anti-Alex Smith. While Chiefs fans have certainly grown tired of Smith’s constant check downs and careful game management at the position, they might one day grow to miss it if Mahomes doesn’t pan out. In Mahomes, the Chiefs have a total gunslinger with poor mechanics and footwork but the physical ability and arm strength to make throws other quarterbacks in the league just can’t. He has a Brett Favre quality to him and Andy Reid will love working with him in an attempt to fix his mechanics and turn him into a big-time player. If he can get things right, Mahomes has the talent to be an elite QB1. If he continues to force throws and rely solely on his talent, he has major bust potential. At this point in a rookie draft, a high risk, high reward player is worth a shot and Mahomes has a monster ceiling in fantasy and reality. very laggy for me as well. The website has been taking a while to load. Painful. Joe Williams at 3.11 is an absolute steal. I would gladly take him in the mid to late second based on talent and landing spot, even with the concerns mentioned. Just my two cents. Wanted to write a comment just for that. JW anywhere in the 3rd after the draft is a steal. I’m taking him 2.06+, especially if I have Hyde.